Melissa and Christian Stepien made it out safely. Their home, unfortunately, was completely destroyed. The Jesusita Fire — a wind-driven blaze that scorched 80 homes and nearly 9,000 acres in the foothills above Santa Barbara in 2009 — burned so intensely through the Stepien house that even its foundation had to be abandoned. They were left with three acres of charred earth and a few big oaks. When it came time to regroup and get their heads around the complete rebuild of the place they called home, they found Bruce Giffin through a friend’s recommendation. Bound by building code but offered a bit of leeway in expanding their new home’s square footage, the Stepiens went with the house’s original architect, Hugh Twibell, who drew new plans on top of the existing footprint while making the living room (pictured above) and kitchen (below) slightly bigger, adding more office space, and most significantly, raising the ceilings — with written approval from surrounding neighbors — about two feet to provide more spacious comfort. For details, Bruce drove Melissa and Chris to other Giffin & Crane projects to show them an array of home features to see what they liked. They brought in Genny Cummings with Indigo Interiors. 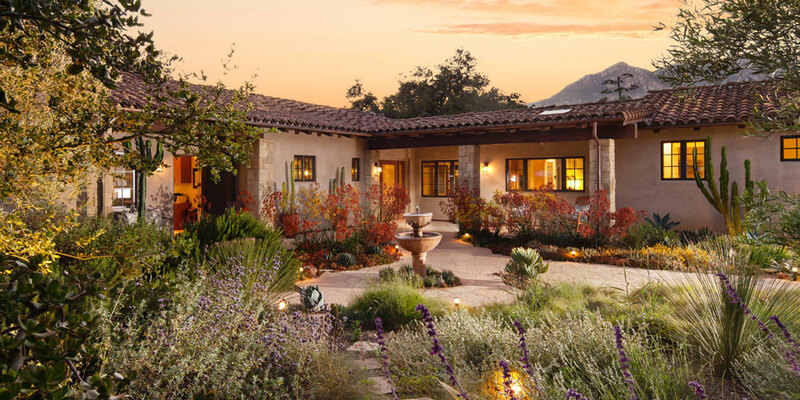 Then finally, for flagstone pathways and world-class landscaping, horticulturist Carol Bornstein dreamed up a drought-tolerant design dominated by natives. Soon, the birds — notably quail, hawks, owls, and vultures — came back in healthy numbers, plus lots of photo-worthy wildlife, including deer, bobcat, and fox. Views take the eye from Cathedral Peak down into Rattlesnake Canyon and on out to the ocean and mountains of Gaviota. All said, their new home — a California Spanish ranch with hacienda traditions — covers roughly 4,000 square feet with three bedrooms, three and a half baths, and two offices. All of it conforms to state fire code, which calls for tempered glass, sprinklers, stucco, and heavily treated eves, among many details designed to save lives and structures. For added peace of mind, the backyard features a two-inch waterline with a valve that’ll hold a firehose.